A distant view in ink of Prudhoe Castle in Northumberland. 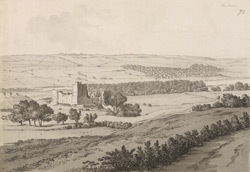 The stone castle was built on the site of 12th century earthworks by Henry II, after William the Lion, King of Scotland, had besieged the site in 1173 and 74. The square keep was constructed the following year, one of the first to be built in Northumberland. It was surrounded at first by curtain walls and a gatehouse. A moat was added in the 13th century, along with two barbicans and a stronger gatehouse. The gatehouse had a vaulted basement and a chapel on the first floor.